This retreat is an amazing opportunity to get into the flow of life. 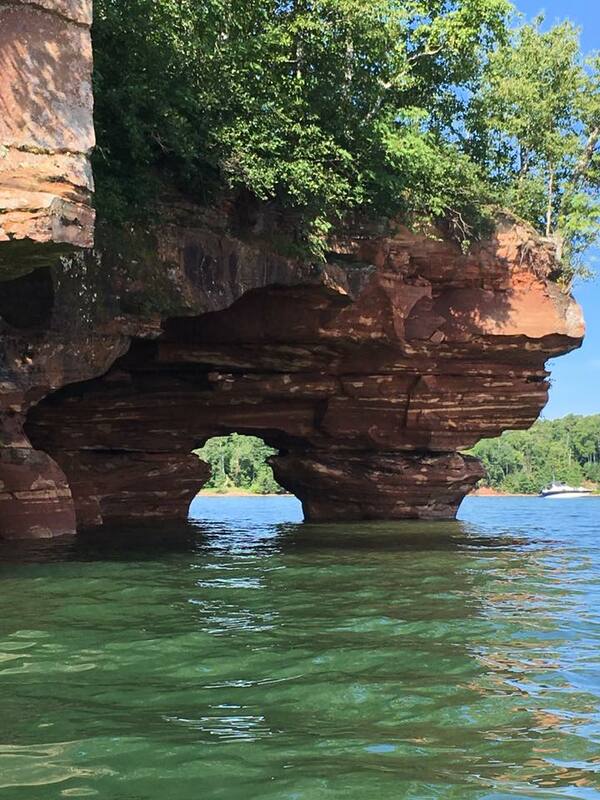 What better way to do that than in a sea kayak, exploring sea caves on Lake Superior! An ideal introduction to the world of sea kayaking, four day format provides enough time to immerse in the outdoors and recapture the spirit of your adventuresome self. First time paddlers learn a range of skills and safety considerations that allow you to feel comfortable embarking on your own future trips. Experienced paddlers fine tune technique and deepen their knowledge of navigation, leadership and decision making on the water. Island features such as lighthouses, sea caves, wildlife, beaches and forests are included! What do we mean by “getting into the flow?" Being in the flow is a state connection to the moment and divine inspiration. It's a state that is open to possibility, redirection, and expansion. -Learn nature related practices to heal and rejuvenate that you can take home and integrate into your life. -Virtual pre-trip meeting Thursday June 26th 7pm (July trip) and Wednesday June 25th 7pm (August trip) to connect with fellow participants and help you prepare (make sure all your questions get answered). This will be recorded in case you miss. -No experience necessary. You don't need to be an athlete or superwoman to participate. If you have health concerns or injuries that may limit your ability to fully participate contact us prior to registration. -Delicious and nutritious organic/local meals Friday morning through Sunday lunch. Meals feature local cheeses, fish and produce. We can accommodate food allergies/diets (check with us before registering if this is important to you). -Pre-trip virtual meeting to support you in preparing for the trip, connecting to participants, and answering any questions. Meeting will be recorded, but attendance is highly encouraged! Note: Tents are typically shared with 1-2 people. If this is an issue for you please contact Laura prior to registration. What if I'm new to camping/outdoor adventure? No need to have prior experience with outdoor adventure/wilderness. This trip is very 'beginner friendly' and we'll walk you through preparing step-by-step. A can-do attitude is essential! Day 1: Set up camp on the mainland, hang out, explore. Group dinner at 6pm. Program officially begins at 7pm with an opening circle. Day 2: Delicious breakfast with organic fresh fruits and vegetables! We'll begin the day with yoga followed by a kayak instruction and safety course. We'll eat lunch, pack up the gear and get on the water. The Sand Island is a short paddle away. We'll have a nice cooked meal made by our guides. In the evening we'll have a special program and a fire. There will be free time to relax, explore, and socialize. Day 3: Wake up to a freshly cooked breakfast. We'll do yoga and meditate in the morning. Then we'll pack up camp and do a day-trip to sea caves and if another island! One the way we'll have lunch and get to the campsite mid-afternoon. We'll have an evening program followed by fire, star gazing, and reflection. Day 4: Wake up to a freshly cooked breakfast we'll do some more yoga and meditation to set ourselves up for the day. We'll head out mid-morning to explore sea caves and a lighthouse if people want. We'll take a break and have lunch on a beach. We'll make our way back to the mainland early afternoon. We'll close with a circle on the mainland and bless each other as we go our separate ways. The program closes at 3pm. 2) Pay deposit of $100. Deposit in non-refundable. Please carefully reflect before purchase. 3) You will receive a welcome email regarding trip specifics, how to prepare, and plan. I will be available for pre-trip questions. 4) Expect pre-trip communication including packing lists, virtual meetings, and additional information to assist you in preparing for the expedition. 5) All balances are due by June 10th. Due to the nature of this event $100 deposits are non-refundable. If cancellation is made before June 10th, a refund will be issued for the amount paid less the deposit. Deposits (and fees if applicable) are transferrable to a new participant if cancellation is made by June 10th. In the event of severe weather, the guides will provide alternatives to ensure the safety of participants.